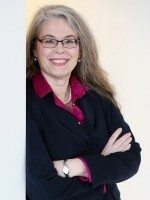 Jo Ellen Whitney is a senior shareholder of the Davis Brown Law Firm. As the chair of the firm's Employment and Labor Relations Department, she has a general practice in, but not limited to, the areas of employment and labor law, health law, privacy, and fair housing. In the area of employment and labor law, Jo handles a variety of issues ranging from business planning and contracts, and representation before administrative agencies such as the Iowa Civil Rights Commission, the Equal Employment Opportunity Commission (EEOC), and local Human Rights Commissions as well as state and federal court. As a prior chair of the firm's Human Resources Committee, she brings practical experience to bear on business planning, discipline, and termination issues for employers. She has extensive experience with contract development, as well as employee manuals, handbooks, and internal policies and practices for employment issues and regulatory compliance, including the ADA/ADAAA, FLSA, HIPAA, and FMLA. 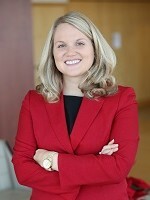 She has developed sample policies for a number of professional groups and organizations including members of the Iowa Telecommunications Association and the Iowa Healthcare Association. As part of her ongoing work involving civil rights commissions, Jo has previously served as a mediator, speaker, and current case screener for the Iowa Civil Rights Commission (ICRC). In recognition of her work with the ICRC, she was awarded the Governor's Volunteer Award for "outstanding contributions of volunteer service to the Iowa Civil Rights Commission." Awards are granted to people or groups who volunteer their time with a city or state government agency, or an Iowa non-profit organization. Jo Ellen received the Governor's Volunteer Award in 2007 and 1997. • Best Lawyers' 2013 "Des Moines Health Care Law Lawyer of the Year." Michele L. (Warnock) Brott is a shareholder in Davis Brown's Litigation Division, with an emphasis on labor and employment and business litigation. She represents employers across the spectrum, from small, local businesses to large multistate employers, including start-ups, franchises, and large corporations to mitigate liability. Michele is a trial lawyer who also advises and educates management about employee policies, including hiring, discipline, and discharge. Iowa Employment Law Letter provides a three-part subscription package to deliver the practical, hands-on advice you need to manage your Iowa workforce safely and in compliance with Iowa and federal laws. That's because the newsletter's editors are Iowa attorneys who defend and counsel employers statewide. Each issue also keeps you on top of Iowa court and U.S. Supreme Court decisions that affect your workforce, all reported with Iowa's local laws and policies in mind. You get the information you need to stay in business — and out of the courtroom. 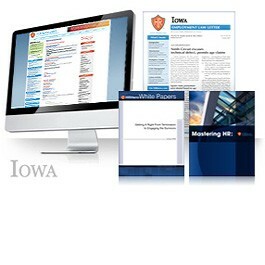 Iowa Employment Law Letter — 12 monthly issues mailed to you and also available online. (Digital-only versions are available with an HRLaws subscription) You also receive email notifications once a month and periodic News Alert by email as needed. GUARANTEE: Your 100% satisfaction is guaranteed. If for any reason you are not completely satisfied with Iowa Employment Law Letter, simply let us know within 90 days, and we will issue you a complete refund.